Shoes | How can I recycle this? 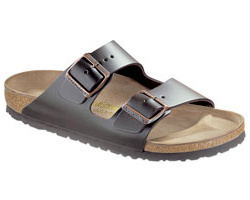 How can I reuse or recycle Birkenstock sandals? What can I do with my old Birkenstock sandals? They’re a combo of rubbery foam soles, cork footbed, and leather straps. 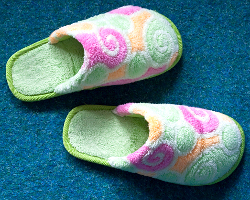 Because they take the shape of my feet, I doubt they’d be good hand-me-downs, but I hate to toss them. Birkenstock has a page about their green production/distribution policies and advice on repairing/maintenance suggestions to prolong the life of the sandals. Birkenstock USA also links to shoe redistribution charity Soles4Souls. Depending on which bit of orangeterra’s sandals has give way, they might benefit from a little repair – get a few more months out of them with new soles – or if the sole is good but the rest ruined/broken, they might be suitable for turning into slippers. Any other suggestions? Or recycling links? How can I reuse or recycle safety boots? 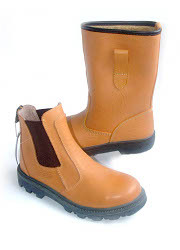 I am looking for a company that recycles or reuses used safety boots and shoes. They are predominantly leather with a steel toe cap and rubber or manmade sole. As a [huge multinational] company you can imagine we have quite a few and at present they go to landfill. Do you know of any businesses that would be interested? I suspect like happens with hard hats, they’re having to be replaced for health & safety reasons – they’ve become too worn/damaged to wear in a dangerous industrial environment. It’s pretty easy to find a textile recycling/reclamation company but harder to find down ones that explicitly ask for leather, let alone safety footwear. Anyone know any companies that specifically deal with these types of boots or leather in general? How can I repair a pair of leaky trainers/sneakers? So first up on our new “How can I repair this?” feature, how can I repair a pair of leaking trainers/sneakers? 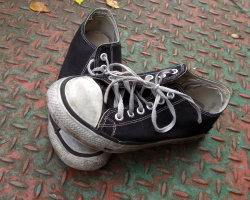 I’ve got a pair of canvas trainers that I love – they’re like the ubiquitous Converse ones but No Sweat ones so sweatshop-free. I’ve worn the hell out of them for about five years and now they’ve both developed leaks in the sole – little tiny cracks/tears around the ball but on one of them the upper has come away from the lower slightly at the back too. I’d rather they didn’t become just fair weather footwear – so how can I fix them? If they were hard soled shoes, I’d take them to a cobbler to be resoled but am not sure if they’d fix soft rubber soled trainers. What about at-home fixes? I remember reading somewhere that someone suggested using silicone sealant to fix a similar sneaker leak – anyone tried that? Any better alternatives? 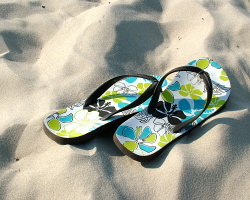 How can I reuse or recycle flip-flops? What can I do with old flip flops? I’m presuming Hannah means the cheap foam ones that are omnipresent in the summer but sadly disappear into the dark, dusty backs of cupboards as soon as autumn arrives, never to re-emerge.